Fine Print: I was given a prize pack and Musselman’s is giving another to a reader. All opinions and statements below are my own. I don’t know about you, but this is how the beginning of the school year starts for my children: Go to school, come home, have a healthy snack, do homework. Week 3: Go to school, come home, have a snack, do homework. Week 5: Go to school, come home, have a convenient snack, do homework. As time goes on, the kids continue to have a snack, but it tends to be based more on convenience than on health. That’s not to say that I don’t try to make healthy snacks, but there is SO much going on that the kids will grab a fruit snack or cheese crackers when I send them to the kitchen to grab something. Musselman’s is hoping to help all of us with this dilemma! They have super convenient apple sauce cups that come in regular and Big Cup sizes. My kids eat two smaller cups in one sitting, so the Big Cups are perfect for us. Plus, they can grab these out of the fridge on their own, peel back the top and enjoy. And as a bonus, I know that it’s a healthy snack. Even better, Musselman’s is doing their part to contribute to the fight against breast cancer! Check your store shelves for our “pink-ribbon” packaging to raise money for the National Breast Cancer Foundation (NBCF). From August through December, every time you purchase select apple sauce and apple juice products with the signature “pink-ribbon” packaging, we’ll make a donation to NBCF. Our goal is to donate $65,000. You can help us get there! 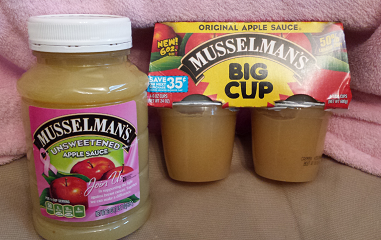 To get everyone into healthier after school eating habits, I am giving one lucky winner a Musselman’s Apple Sauce Prize Pack! To enter this giveaway, complete any or all of the options listed below. Giveaway ends 10/16. Good luck! My favorite is cheese sticks & sliced cheddar cheese with crackers! My two boys love applesauce! My favorite healthy after school snack is fruit salad. My favorite after school snack is applesauce and a banana. We like any kind of fruit. Chips and snack cakes are the most popular snacks in our home. We love apple sauce any time of the day! We love string cheese & apples. My favorite healthy after school snack is fresh fruit. I like hummus and pretzels as a healthy snack. We like carrots and dip or apples and peanut butter. My kids’ go-to snack is applesauce and cheese! I like to eat fruit as an after school snack! Our favorite after school snack is applesauce or yogurt. I’m a sucker for a good granola bar. We love fruit as an after-school snack.